TURTLE is an open and chaotic network of diverse but interconnecting ideas, people, projects, events, and venues linked by American filmmaker, Michael H Shamberg. 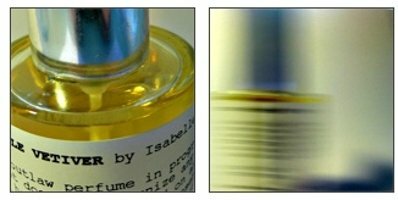 Perfumer Isabelle Doyen’s contribution is a Vetiver EdT which she makes in small quantities and constantly changing formulas. You can read more about the Turtle project here, but I'll skip right ahead to Turtle Vetiver, or more specifically, Turtle Vetiver Exercise No. 1 — as implied above, Isabelle Doyen will change the formula when the first batch (80 bottles) runs out. Before it's gone (and I hope it's gone soon as I'd like to see what she does with Exercise No. 2), vetiver freaks (and I'm not really sure this one will appeal to anyone else: it is VETIVER, all capped) might want to get their hands on a sample. I have no idea what the notes are, but Turtle Vetiver starts bright and citrusy and green. The brightness fades, but the citrus notes linger into the dry down. The vetiver is strong and earthy from the start, and it's layered over something that smells to me like steaming rocks covered with dirt — it reminds me vaguely of the dusty mineral accords in Terre d'Hermès, but slightly darker here. Farther on, the mineral facet fades, and then it's a rich, deep, woody vetiver, middling dark. To my nose, it's deeper and earthier than Frederic Malle's Vetiver Extraordinaire, but it's a very smooth scent, with none of the jarring aspects of, say, Maître Parfumeur et Gantier Route du Vetiver. In other words, it's very wearable, so long as you like vetiver. LesNez Turtle Vetiver Exercise No. 1 is available in 50 ml Eau de Toilette ($99) or 2.5 ml samples ($10). The lasting power is excellent. For buying information, see the listing for LesNez under Perfume Houses, although I do not know if they're planning to distribute this one outside of their own website. Wow Robin, it seems to be a good fragrance year for you so far! Never had the chance to sniff this one. I always think of buying a few samples from their website but somehow I never do it. I couldn't possibly be defined a vetiver freak, the only vetiver I love is Vetiver tonka. Instead, I love and own The unicorn spell and I'm really looking forward to sniff their Manoumalia. Did you sniff it? Hi, Robin. Thanks for reviewing this. I've been wanting to test this one since perfumeshrine reviewed a few months ago. In fact, I was just contemplating ordering some from their website. (Guess I'd better hurry if I want to beat the stampede of vetiver lovers). Still seems like I've smelled more bad things than good, but yes…not a totally bad year so far! Manoumalia is very well done but not my taste at all. Very much worth trying though! I seriously do hope they sell out of the 80 bottles & soon…would be cool to get several new vetiver scents a year from Isabelle Doyen, no?? The sample is worth $10, IMHO…2.5 ml spray is not bad at all, and since it isn't light you'll get quite a few wears out of it. Ok this sounds right up my alley! I may have to go get one of the samples. Manoumalia wasn't to my taste either, too sweet, but this could be a real hit. I think this is the first time I have actually smelled your comparison fragrances! I got all into a big vetiver twist when I first got on here and am trying lots of them. I am having a hard time selecting a favorite for a FB! I guess I need to add this to the list. Sigh. Sweet and strong! I liked it better on paper than on me, but again, it just isn't my style regardless. This one is entirely different, perhaps more in the spirit of the first 3, although it's deeper than any of those. LOL — I'm sorry, I don't purposely pick obscure fragrance references but I suppose it works out that way. What are your favorite vetivers so far? I couldn't scrub this one off quick enough . But that's on my skin; I am so glad it smells so much better on Robin. I did get a sneak sniff of AG matin'dorage, and appreciate Doyen 's work there, but she never blows me away. For something lightweight and citrusy I like the CdG Vettiveru (or is it Vetiverru?) and plan on a bottle. in the richer vein I like FM Vetiver Extraordinaire and AT Vetiver Dance, and am leaning toward the FM a little, although AT is easier on the pocketbook and it lasts forever. I find it interesting that spellcheck accepts “extraordinaire” but not “vetiver”. I love Opus Oils “Eros”, which is amber, mandarin and vetiver, so not purely vetiver, but reminds me of my mom, who wore Kiehl's Vetiver for a while. Onda is definitely in the running when it comes to the rich scent that reminds me of those tubes lined with cedar that cigars come in. I about fainted with joy when I accidentally put too much on one day, which turned out to be the right amount. I like the Givenchy, and Chanel Sycomore, but they have not stood out too much for me. I haven't tried the Guerlain yet. The MPG Route de Vetiver is a daunting one, but I rather liked Racine. I think I just like varying degrees of vetiver in general, but it has been fun to really explore one note. I have not tried that Opus Oils one. Wouldn't mind having a bottle of that CdG, it's nice for summer. I like Paul Smith Story for a light citrusy vetiver too, but nobody else seems to! You might want to try Lalique Encre Noire, that's another great vetiver. A scrubber, no less! Ah well, $ saved. Annick Goutal Vetiver: vetiver with an interesting salty, iodine note. Parfums de Nicolaï Vétyver: beautiful, spicy vetiver with black pepper and a touch of cumin. Guerlain Vétiver Pour Elle: vetiver with a touch of jasmine and light musk. vintage Guerlain Vétiver: has a lovely tobacco note that is unfortunately lacking in the current formulation. Hermès Vétiver Tonka: vetiver with a delectable hazelnut facet, and one of my favourites from the Hermessences. Malle's Vetiver is my favorite vetiver ever. I can't believe something could be more Earthier than it. Now I'm intrigued! The bottle's label looks like Le Labo's minimal laboratory typewriter style. Thanks for the recs, though, I do appreciate it! Interesting review, R. Thanks. You know, I really like vetiver, but I feel that it's such a strong note that so many vetivers start seeming very much the same to me. I know one could say that about almost any note, but I could be happy with only Sycomore & KenzoAir for the rest of my life, so maybe I'm just not the same type of vetiver connoisseur that you, Tama, and jtc are. It's nice having Encre Noir and V Extraordinaire around too, but again, they all start smelling the same: vetiver, vetiver, vetiver. I guess some people feel this way about oud — it bulldozes everything in its path sometimes. Granted, there are still a LOT of well-loved vetivers out there that I haven't tried. Maybe the ones I've tried have just all struck me as way too similar. Of course, when vetiver is only one component of a scent it's a different story, as in Terre d'Hermes. Also just remembered TDC Sel de Vetiver and just pulled out my sample and put some on. Now there's one I love which doesn't sock me over the head with a capital 'V'. I've been meaning to get a bottle of this for a long time! And here I sit with V.Extraordinaire, Encre Noir, Terre d'Hermes, and SdV on different patches of both arms. I smell pretty good if I say so myself. Okay, let me sniff on the Encre Noir part, I adore this scent! Very wearable for a woman, too. This one is quite different, has less of a “synthetic” feel than the Malle (although that is not meant as a diss on the Malle, which I adore). Joe, you're absolutely right that they're all very similar — you either want 10 variations on a very limited theme, or you don't! I really don't think the average person has any interest in having so very many. I tend to love scents with vetiver and musk, how's the lasting power with Encre Noir? The cashmere woods and musk notes sound great. Encre Noire seems to have decent lasting power from what I can tell. I'm not sure I get any cashmere woods or a whole ton of musk either, but it's definitely a straight-up, deep, potent vetiver. Joe, thanks for the feedback. I love straight-up deep vetivers. Might give it a try this weekend….